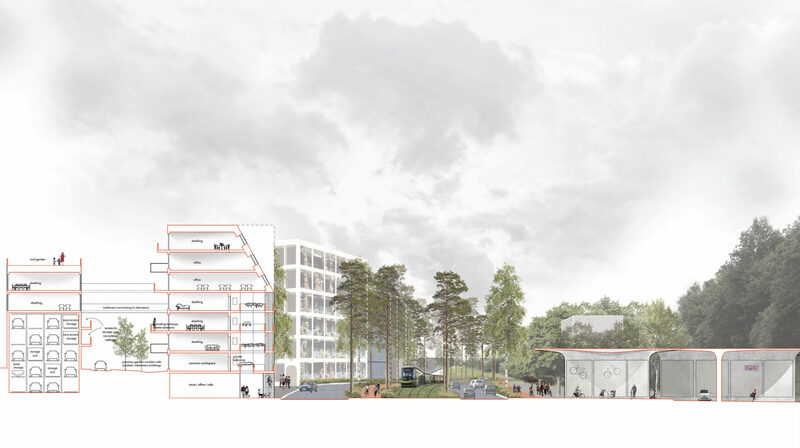 This project discusses three themes – productivity, boulevardisation and a contemporary way of living in the forest – all in the context of the new (sub)urban boulevard in Laajasalo. 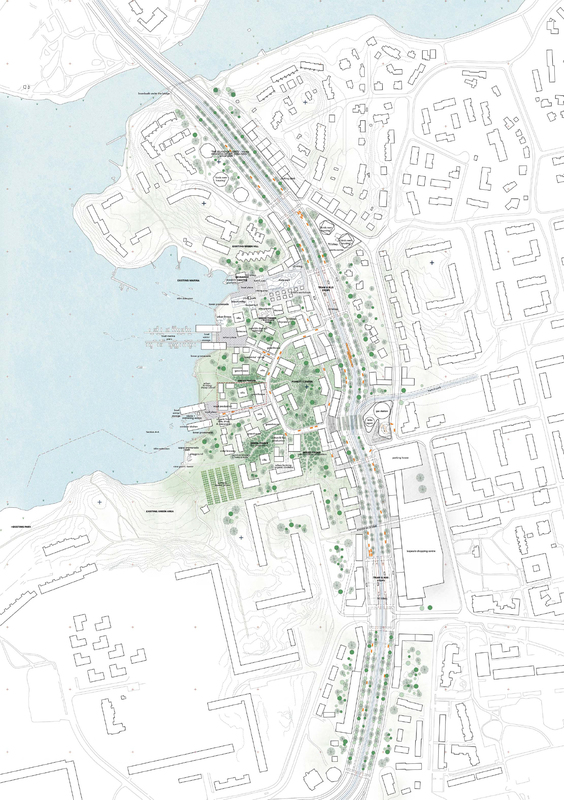 As the new Helsinki general plan aims to densify the city structure by transforming up to 30 km of highways into urban boulevards, it raises a question of the milieu of surrounding housing areas. 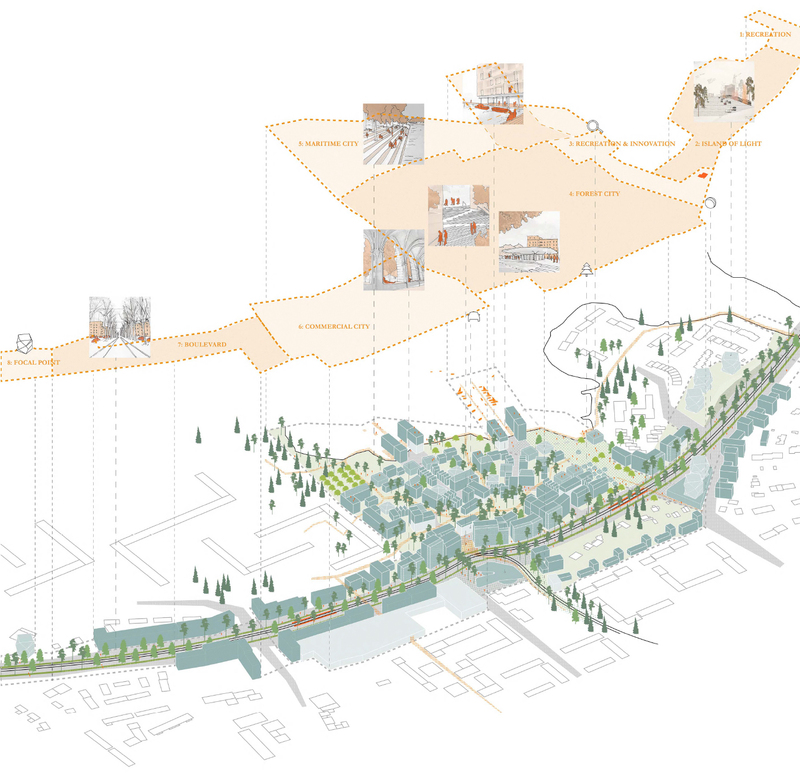 Pineline is most of all a case study of how the boulevard and nearby areas support each other, of how to make amiable spaces in the challenging conditions of this traffic corridor, and how the notion of productivity can add quality in the cityscape. As this project conceives productivity, it is about producing goods and services, but also diminishing the commutes and transports. By doing so, our productive time is maximized – regardless of whether we use it for working hours or for creativity and recreation. Pineline addresses productive cities as a holistic inclusion of all the aspects of life – age, life situation, function – all catered for within walking distance, and implemented as a natural part of the city structure. This turns Tengströminpuisto into a village full of surprises and space for everyone, from nesting birds to hardworking plumber. The design task was dominated by the discussion of Laajasalo’s maritime nature. Helsinki has more than 130 km of shoreline, and all of its inhabitants live maximum of 10km from the shore. In Laajasalo this distance is less than 800 meters – the need of introducing water in the city structure is debatable, living with the sea is already a part of the everyday reality. Therefore, the one feature Pineline sees as even more dominant in Laajasalo, is the cardinally Finnish way of dwelling in the forest, also present in the areas current ways of living – the single family house with distinct forest cover and the modernistic superblock superimposed in the forested cliffs. The aim of the new design is to create a new holistic way of dwelling within the forest. In addition, Pineline discusses levels of identification in the city structure – quarter, super block and Tengströminpuisto housing -, and strives towards heterogeneous, communally active, population on all of these levels. The new district functions in symbiosis with the transformed boulevard – the boulevard offers an easily accessible market place for goods produced in Tengströminpuisto, which in return inhabits people working in offices on the boulevard and the story goes on. Quite decent plan with twist of forest. However, does not bring the feeling of a central, but it is not necessary bad thing. Suunnitelma jättää ympäristön ominaispiirteet täysin huomioitta ja on massaltaan karmaiseva. Tukkii alueen täysin.